For so many of us lemonade conjures up thoughts of our childhood and this is just my twist by adding in some peach puree for added fruitiness! Cut the lemons into small chunks and place in a food processor or liquidiser with the sugar and half the water. Blitz well until it is as smooth as the processor will allow and then pass the mixture through a sieve into a large jug. Add in the remaining water and taste, adding in some additional sugar as required (bear in mind that the peach puree in itself will add additional sweetness). Place the diced peaches, sugar and water into the food processor and blitz until smooth. Pass through a sieve to achieve a smooth consistency and then transfer to the fridge to chill. 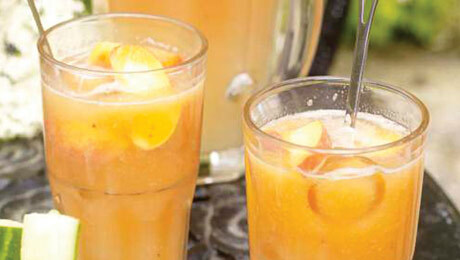 Place some of the peach puree at the bottom of each glass and top with the tangy lemonade. Serve immediately with some additional sliced peaches in the glass.